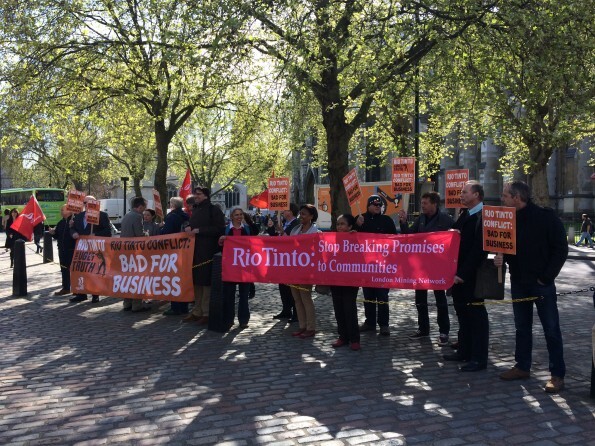 Yesterday’s Rio Tinto AGM was widely covered in the press and social media. John Vidal wrote in the Guardian about recently published reports about the impacts of Rio Tinto’s uranium mining in Namibia. These reports were also featured in Independent Business Times, the South African Mail and Guardian and mining industry news website Mining.com. Rupert Neate wrote about the protest that we, our West Papuan friends and global mining union IndustriALL put on outside and about the concerns that we and our friends raised in the AGM about the Grasberg mine and the company’s Madagascan operations. Madagascan matters were highlighted also by industry publication Industrial Minerals and by Independent Catholic News. Deaths at Grasberg featured in Coutts news and worker deaths in general in Blue and Green Tomorrow. ABC in Australia noted that Rio Tinto refused to guarantee help for its ERA subsidiary in Australia in cleaning up the radioactive spill at the Ranger Mine – while ERA is telling local Aboriginal people that they will have to allow it to expand the mine if it is to have enough money to guarantee those clean-up costs itself. Australia’s ABC and The Age Business Day also reported on this, as did the Sydney Morning Herald, which added a mention of the company’s refusal to get out of coal production despite its acceptance that climate change is causing grave problems. The Financial Times carried an advertisement thanking Rio Tinto for pulling out of the Pebble Mine in Alaska. Many of us hope this will be followed by plenty more withdrawals! A webcast of the whole AGM is available on the company’s website at and we will post our own reflections on the AGM soon – including coverage of concerns raised about the Oyu Tolgoi mine in Mongolia and the Resolution Copper project at Oak Flats, Arizona. A video of the protest outside is at http://bambuser.com/v/4536489.